My last column concerned the quiet but efficient attempt by the New World Order crowd to implement their Agenda 21 scheme in Phoenix, Arizona. This is not a new issue to Arizonian’s except to the new comers fleeing the soviet state of California who may be unaware of Arizonian’s previous attempts to thwart the loss of their States sovereignty to non-elected bureaucrats of a New World Order. It hasn’t stopped. They’ll never stop! For the record, when it was first broached, Arizona’s politicians came under immense pressure from grassroots activists to stop it. 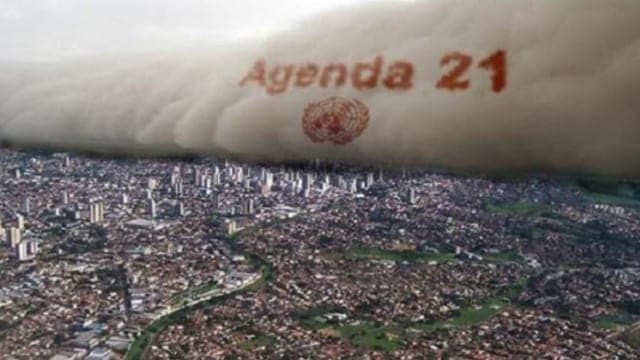 Consequently, Arizona’s Senate voted to approved legislation that banned the United Nations “sustainable development” scheme, aka: UN Agenda 21. The Arizona Senates legislation, S.B. 1403, was summarized as “an act prohibiting the state and its political subdivisions from recognizing the United Nations or any of its declarations as legal authority in this state.” This all occurred in 2012-13. Several other states, alarmed at the UN’s shenanigans, including Alabama, also passed laws prohibiting their states from implementing any such silly schemes. Georgia didn’t! Apparently neither did Arizona. To briefly recap, the UN Agenda 21 scheme was designed as a “sustainability” plan to “radically restructure human civilization under the guise of environmentalism and fighting poverty.” Noble, but fallacious goals indeed. The UN itself provides the following description: “Agenda 21 is a comprehensive plan of action to be taken globally, nationally and locally by organizations of the United Nations System, Governments, and Major Groups in every area in which human impacts (sic) on the environment.” Sounds very much like totalitarism. Arizona’s S.B. 1403, was summarized as “an act prohibiting the state (Ariz.) and its political subdivisions from recognizing the United Nations or any of its declarations as legal authority in this state.” Specifically targeted was the UN’s report: “Rio Declaration on Environment and Development” and the “Statement of Principles for Sustainable Development” adopted by dictators and national governments at the 1992 international “sustainability” summit held in Rio de Janeiro. The Arizona legislation pointed out that “officials are bound by their oaths to the Constitution.” Political subdivisions were defined in the bill as the state, county, city, or town governments, as well as any “special districts” authorized by local officials. The bill also recognized that the UN uses numerous so-called “non-governmental organizations” (NGOs) to implement its agenda including a Germany-based group known as ICLEI, formerly the International Council of Local Environmental Initiatives. Aid or assistance to these groups was specifically prohibited as well. I do not see where the Arizona Governor signed it into law. US critics of the Agenda 21 scheme are correct when they say that the UN and its associated dictators, should have no involvement affecting US Policy. Under our Constitution Americans do not need other nations, collectively or individually, telling us what we need to do in our country. American blood has insured continence of the few freedoms we now still have. This thing just doesn’t seem like it can be killed. Like a disease, it keeps spreading. Arizona headlines as late as this months report: “A new initiative to grow smart city projects is taking hold in the Phoenix metro region. The project, called the Greater Phoenix Smart Region Initiative, is a public-private nonprofit partnership that includes the Arizona State University Center for Smart Cities and Regions, the Arizona Institute for Digital Progress, and the Greater Phoenix Economic Council.